In a presentation to the UK All-Party Parliamentary Rail Group on 15 September, Mark Carne, the Network Rail Chief Executive outlined the changes in strategy that had been necessary since the company had been effectively nationalised after the re-classification of its debt as a Government liability. The drivers of policy were that changes must not risk any dilution of the excellent safety performance, and that alternative sources of capital were needed. As part of future decision making, the 8 route-based organisations would be developed as separate businesses which would allow local planning to provide capacity to meet the expectation that passenger numbers will double in the next 25 years. This recognises that a lot more can be achieved in capacity terms from the existing infrastructure whilst the carbon footprint is also reduced. In the past NR had not needed to find partners for investment given its own the access to private sector capital but with a new regime of Treasury control the benefit of third party investment was more attractive. It was suggested this could cover a wide spectrum such as joint ventures for investment in stations and developing infrastructure concessions. There would also be opportunities for the funding of enhancement projects where in return for the profit margin there would be a genuine risk transfer with an agreed price for delivery by the contractor. As things are the funding options have been reduced as additional borrowing cannot now take place to fund projects where a cost overrun occurs. 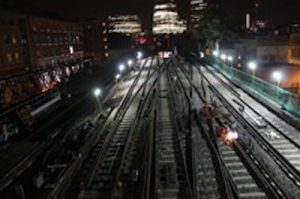 This particularly applies to the main line electrification schemes where early estimates have proved to be too low to reflect unknown ground conditions that emerged as construction started. The lack of an approved catenary design and the need to comply with inter-operability standards has also resulted in a greater amount of bridgework. Work is currently being led by the NR Chairman Sir Peter Hendy to prioritise the projects that can be afforded in the current Control Period to 2019 and in answer to a question Mark Carne said that freight requirements were massively important because of the number of lorries a typical trainload can remove from the roads. Enthusiasm remains for alliancing with train operators despite the withdrawal from the South Western alliance although some elements such a joint control room have been retained. Implementation in Scotland is considered more viable and if that works it can be used as a template for elsewhere. The framework agreements with infrastructure companies now covers 85% of the supply chain and a new initiative is to expand NR’s apprentice scheme to cover staff employed by suppliers. A need for greater innovation was identified which was likely to improve with the involvement of third parties on a more local basis. Such inputs were likely to capture greater benefits from investment as a result of improved knowledge about local economic needs. FCP can offer in-depth skills and experience to third parties wishing to plan rail investment.